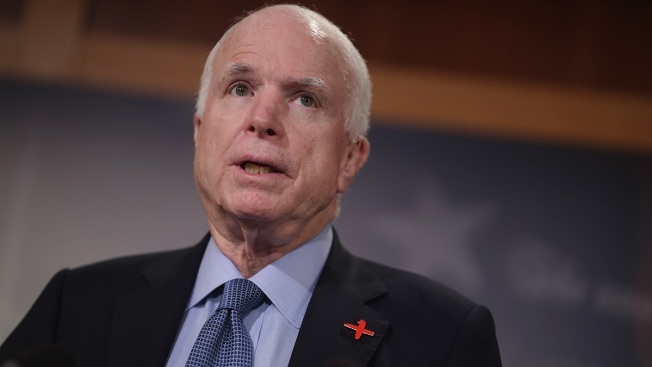 This February 24, 2016, file photo shows late Senator John McCain, R-Ariz., at the Capitol in Washington, DC. President Donald Trump on Saturday lashed out against an old nemesis, the late Sen. John McCain, for his crucial vote against repealing Obamacare in 2017, NBC News reports. In the same tweet, the president echoed former independent counsel Kenneth Starr's remarks on Fox News in response to reports in conservative media outlets that allege the Republican senator from Arizona was the source of a leak that put a Trump opposition-research dossier compiled by former British spy Christopher Steele into the hands of multiple media outlets. The reports about the source of the leaks have not been confirmed by NBC News. The dossier alleges the Trump campaign worked with the Russian government to defeat rival Hillary Clinton in 2016. The core allegations in the dossier compose the heart of special counsel Robert Mueller's investigation into Russian influence on the presidential election. "The more we find out the uglier it becomes," Starr, referring to the alleged media leaks of the dossier, said recently on Fox News' "Fox & Friends." "The Steele dossier I think has been very substantially discredited." In December former U.S. Attorney Chuck Rosenberg said on MSNBC that "the dossier holds up well. None of it has been disproven."